Sleepy - $75 Claimed by @/JurisCat ! -has a bell to use as an "alarm clock"
Sassy - $65 Claimed by @/captyns ! sent!! can I get a sep file? anyone / multiples in here !! 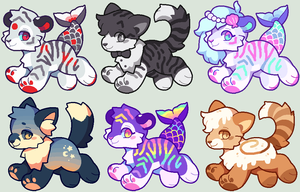 feel free to poke around the rest of my th just nothing from fursonas ! np ty for looking ! ooo i luv the second one!!! For either of them :0? Cute design! But not really something I would use sorry, thank you for offering though! Aw thank u anyway tho it’s no prob!! ur a huge inspiration btw love ur work!! Thank you so much that means a lot ; __; <3! !